Abraham Woodhull, portrayed by historian Beverly Tyler, leads tour-goers on a walk through the nature sanctuary that was once Woodhull’s farm. 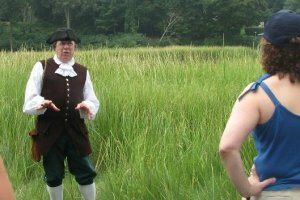 Tour-goers are introduced to the woods, fields, ponds, and bays that tell the story of Long Island’s colonization and settlement preceding the Revolution and the creation of the new nation. Participants on the tour will learn how Benjamin Tallmadge, head of General Washington’s Secret Service, set up an undercover message system, and will see copies of maps and spy letters. Tour lasts approximately one and one half hours.